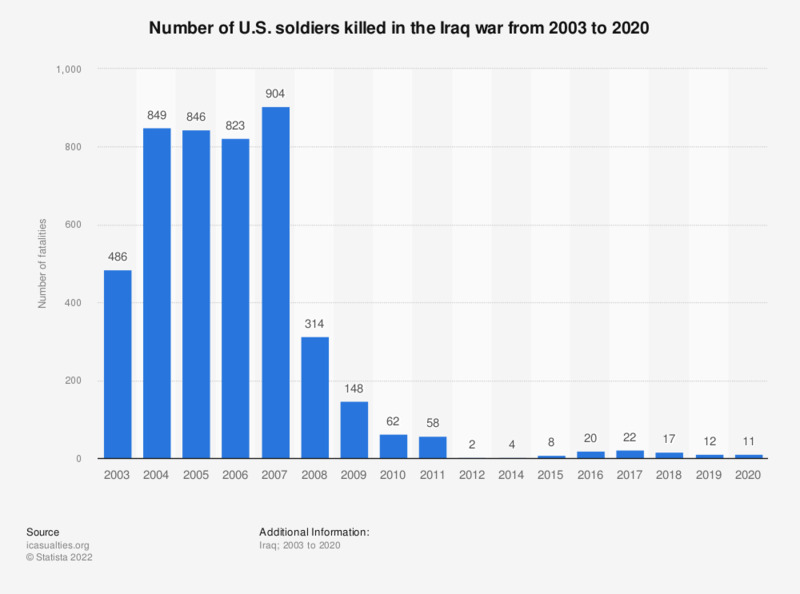 This statistic shows the number of U.S. soldier fatalities in the Iraq War in the period between 2003 and 2018. In 2018, eleven U.S. soldiers died in Iraq. The invasion of Iraq by the United States and coalition forces in March 2003 saw the beginning of the Iraq War, a conflict that would continue beyond the end of the decade. Fatalities of American forces were highest in the first five years of conflict as soldiers grappled with the Al Qaeda as well as civil war between those groups seeking to fill the power vacuum left by the removal of Iraqi leader Saddam Hussein. Casualties progressively decreased from 2008, in part due to attempts by Barack Obama who made the removal of troops from Iraq a central promise of this successful campaign to succeed George W. Bush. In 2013, the majority of Americans considered sending troops to fight in Iraq to be a mistake. While the number of civilian deaths in the Iraq War was much higher, the trend of numbers decreasing from 2008 onward was in line with the trend for American solider loses. However, civilian deaths rose again from 2013 onward as Iraq returned to heavy conflict with Islamic State. The high number of American fatalities in the first five years of the Iraq War could be seen as influencing the reluctance of the United States to commit ground troop support in the battle against Islamic State when the issue was discussed in 2015. Not only is the loss of life a tragedy in itself, but the political discourse in the United States surrounding the involvement of their troops in Middle Eastern conflicts has made further involvement unattractive to elected officials. However calls for further ground support are likely to continue as Iraq remained the country with the most terrorist attacks as of 2014. *As of June 12, 2018. No figures are provided by the source for 2013.